BOB ARUM: This is a conference call with the greatest fighter since Muhammad Ali. A guy that I can’t wait to see in a historic fight that has never happened before – in each corner a fighter having two Gold Medals. This is an historic battle and it’s going to be one of many historic battles for Vasyl Lomachenko who I have said from the beginning he is the best fighter I have seen since the early Muhammad Ali. VASYL LOMACHENKO: I would like to thank everyone who is participating in this call. This is the first time I am going to be talking in two months about the fight. Yesterday was my media workout day and I am very happy to talk to the media about this bout. You said yesterday that if Rigondeaux wants to win he will have to come straight at me. Do you think Rigondeaux is going to do that? VASYL LOMACHENKO: No, I don’t think he’s going to be doing that. He has never done that in his whole career. When he goes forward he falls down in the ring. I don’t think he’s going to be doing that. Can you respond to Rigondeaux’s comment saying you wouldn’t fight him at featherweight? VASYL LOMACHENKO: We all can’t believe in that nonsense. There is a video of one of the reporters asking him ‘would you like to fight Vasyl Lomachenko?’ when he was at 126. He said to the reporter “wait a second, what weight am I fighting?’ and the reporter said 122 and he said ‘well what kind of questions do we have? I am at 122.’ It is on video on YouTube – anybody can find it. It’s not the truth. How do you feel about the two greatest amateurs in the history of the sport fighting against each other? VASYL LOMACHENKO: Yes, I agree that it is a historical bout, it is an interesting bout and most importantly it is an interesting bout for me. A lot of time was spent to make this bout. For awhile it was never happening and finally it happened. It is very, very interesting and all of the boxing fans wanted to see the bout and finally we can deliver it. Rigondeaux is known for his defense – how do you break through it? VASYL LOMACHENKO: Yes of course I have a plan in my head, a picture of what I am going to do but I don’t think it would be too smart to talk about it right now. I think it is better one time to see than 100 times to say. Are you worried that Rigondeaux may go in there and stink it out? BOB ARUM: Let me give you my expert opinion because I’ve been around the sport for a lot of years. What you are looking at here are two different schools of boxing. The Cuban and the Eastern European. The Eastern European, let me start with Vasyl Lomachenko – he is very technically proficient and very good and when he is fighting he is very defensive minded, looks for an opening, but always with the goal in mind, not only to win a points victory but also to hurt, or knockout or make his opponent quit. Watch every one of his fights – it’s always designed, very crowd pleasing because it gives the crowd – the crowd gets into it – because he is looking to destroy his opponent. That’s pretty much the Eastern European style. The Cuban style is different, they pile up points then they stink you out till the end of the fight because all they care about is winning the fight on points. So in this fight, Vasyl will not allow Rigondeaux to pile up points, so Rigondeaux, to win the fight, will have to be more aggressive than he wants to be. When you watch Rigondeaux fight you will see a fantastic fighter who is aggressive, piles up points and then stinks you out by just coasting to victory. That’s the Cuban style – just win, brother. Win by the points — a different style form the Easter European. I think this is going to be a very, very good fight, a very interesting fight because Rigondeaux is not going to be able to gut out a big lead on points on Vasyl, therefore he will have to fight the entire fight as long as it goes to win a victory. BOB ARUM: Rigondeaux is a very, very good fighter. He is one of the best fighters that I have seen. He is a terrific fighter. You can’t let him pile up points because then he will coast and stink you out. Vasyl is no only a great fighter – he is the best fighter since the young Muhammad Ali. He will not seed the ground early, therefore Rigondeaux will have to fight the entire fight in order to win and therefore I see a very, very exciting fight and you are going to see the best of these guys. When Bob Arum calls you the best fighter since the young Muhammad Ali does that put added pressure on you? VASYL LOMACHENKO: I am hearing from Mr. Arum saying these things about me for almost two years. It doesn’t put pressure on my any more – it used to but no more. How long did you know this fight would be next and how did that factor into your Twitter war? EGIS KLIMAS: We were fooling around with Twitter – the people that run Rigondeaux’s twitter, they were very aggressive abut the fight. To tell you the truth, I never believed the fight was going to happen until I got the phone call from Bob telling me “the deal is done, I have a signed contract, so let’s get ready for the fight.” That was the only time I knew the fight was going to happen. Orlando Salido is also fighting December 9. Should you both be successful, do you think a revenge fight with him would be next? VASYL LOMACHENKO: Yes, sure but I don’t think he’s going to fight me because he already found, to him, a good excuse. He’s been saying, “I don’t need this bout. Lomachenko needs this bout. So because Lomachenko needs this bout you need to pay me good money.” That is just his excuse and Salido is nobody now. Do you have any plans to fight above 130 pounds? 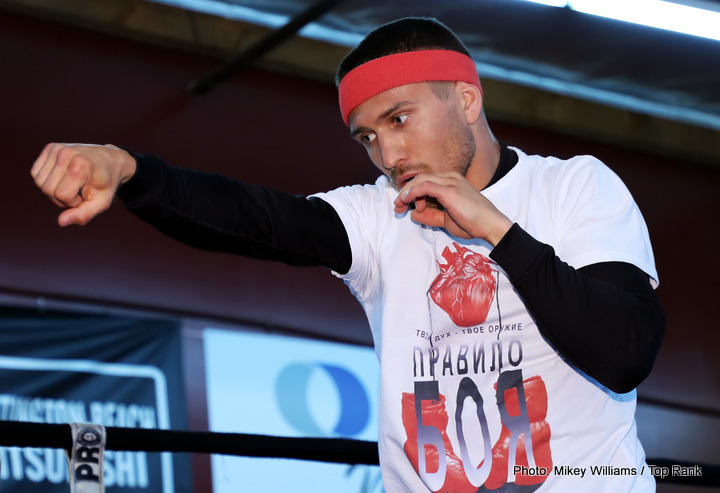 VASYL LOMACHENKO: I already said that I am ready to fight at 130 or 135, but that is not my job. Whoever is going to be put in front of me I will fight. It is not my job to organize the bouts. It is not my job to choose opponents. My promoters organize the bouts and whoever they put in front of me I am ready to fight at 130 or 135. I never passed on any of the bouts and I never passed on any of the opponents. You recently said, “I am going to squash him.“ Will you be satisfied with anything other than a knockout? VASYL LOMACHENKO: I said I am going to walk through him like a tank. They are two different things. I am going to walk through him like a tank and knock him out. They are two different impressions. I am like every single fighter – going into the ring I have in my mind ‘finish the bout before all the rounds are over and to get the victory before that. There is a good possibility that the fight will end before the twelfth round. I am not promising to knock him out but I am promising to squash him. BOB ARUM: I just can’t wait for December 9th. We had a fastest sellout in the history of Madison Square Garden. Everybody who is anybody is going to be at the fight. We expect a tremendous rating on ESPN. This will be Loma’s second fight on ESPN. He is one of the tent poles in the ESPN-Top Rank boxing program. As far as this fight, it should be a tremendously interesting fight. Whether he’ll go up to 135 after this fight we’ll see. I know we have a tremendous offer for Loma to fight in Australia against Paul Fleming who will be fighting on December 13 and of course ultimately some time next year you’ll see Loma fighting for the lightweight championship of the world. VASYL LOMACHENKO: Thank you very much for your attention and we’ll see you in New York! Top-rated pound-for-pound fighters and Olympic legends VASILY “Hi-Tech” LOMACHENKO.and GUILLERMO “El Chacal” RIGONDEAUX will go mano a mano in a collision of world champions, Next Saturday, December 9, at the The Theater at Madison Square Garden. This historic battle will mark the first time two-time Olympic gold medalists have fought each other professionally at the highest level. Lomachenko will be defending his World Boxing Organization (WBO) junior lightweight world title against the reigning World Boxing Association (WBA) super bantamweight champion Rigondeaux. The fight, which will headline a spectacular all-action card that will be will be televised live and exclusively at 9:00 p.m. ET / 6:00 p.m. PT on ESPN and ESPN Deportes and stream live on the ESPN App, beginning at 7:30 p.m. ET / 4:30 p.m. PT.